This 30-minute treatment is fast, super-affordable, and incredibly beneficial for all skin types and all ages! Best of all, there’s no downtime. DermaSweep from Ziba Medical Spa is the perfect lunch hour skin refresher! 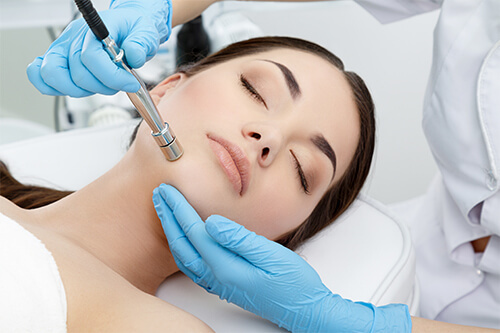 DermaSweep is an advanced version of microdermabrasion. The system uses gentle spinning bristles and suction to deep clean, exfoliate, and remove dead skin cells while promoting circulation and collagen stimulation. Your skin is then rejuvenated with exclusive infusion solutions for your specific skin type. Infusion solutions are formulated with the purest, parben-free, ingredients such as: Vitamin C, peptides, and skin nourishing proteins that help correct and perfect your skin. DermaSweep With SkinFusions from Ziba Medical Spa works wonders on fines lines, pores, and early sunspots while it clarifies, and improves the tone and texture of your skin – INSTANTLY! You’ll experience noticeably softer, smoother, more evenly toned skin after 1-treatment. Lasting results are achieved overtime with multiple treatments.